Several big name movies are debuting this week, but only one is opening in theaters at the same time it will be available in your living room. 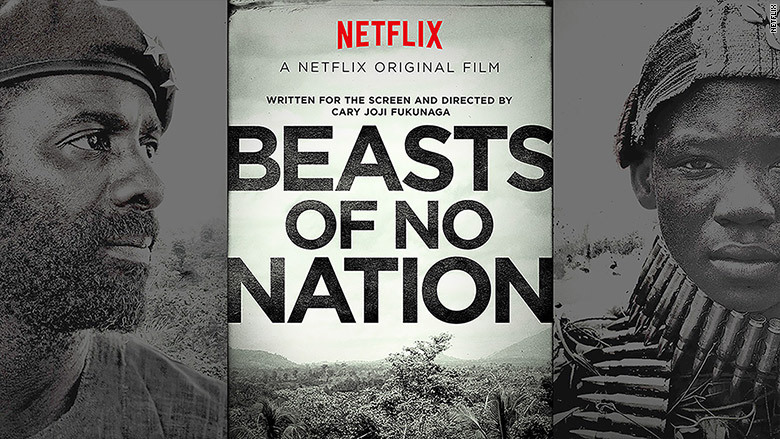 Netflix's "Beasts of No Nation" opens in limited theaters on Friday, but Netflix users can also watch the film at home. This is the first theatrical release for the company. This move along with the film's limited release has perplexed box office analysts to the point of where some don't even have a projection for the film's opening weekend box office. "It's a wildcard and a confusing business strategy," said Phil Contrino, chief analyst at BoxOffice.com. "There's a different dynamic here. With other VOD movies that simultaneously open at home and in theaters you have to pay something. But Netflix users most likely already paid for it via their subscription." In its earnings report this week, Netflix said it has nearly 70 million subscribers. The film, which stars Idris Elba as an African warlord, is getting rave reviews and a 90% score on review site RottenTomatoes.com. The drama is also catching a lot of Oscar buzz for Elba's performance. Netflix's move to release the film in theaters and on the service at the same time has caused many big theater chains to block the film. It's also made if difficult to judge just how big of an audience the film will bring in. "Netflix doesn't release how many people watch its content and there needs to be that transparency or we're not going to be able to gauge its success," Contrino added. "It's an important stat." "Beasts" will have a lot of competition this weekend as the new Steven Spielberg, Tom Hanks film, "Bridge of Spies," and "Goosebumps," a family film based on the beloved children's books, also hits theaters. "Spies" is projected to bringing roughly $20 million in the U.S. this weekend while the Jack Black led "Goosebumps" is predicted to make $25 million to $30 million, according to analysts.